Human has been developed technology hoping to live more safely, healthfully, and eternally. Consequentially, we are surrounded by what we made, which is a new environment for unknown creature, "Digital Being." “DIGITAL BEING” is an unknown A.I. born from abandoned and forgotten technologies. It reveals itself through an atypical movement or an interaction according to the machinery that it dominates. There are very simple digital codes in all electronics, such as televisions, speakers and computers. Not only is the daily output of these electronics incalculable, but also an enormous number of them are discarded. Unless the memory chips or CPUs of the circuits are completely destroyed, they can still operate by the command codes inside their bodies. What if these command codes were accidentally and repeatedly combined, generating mutant codes and errors among themselves? What if a code were to realize its consciousness during this continuous operation? As digital technology continues to develop and more e-waste is produced, the possibility of machines to unexpectedly interact dramatically increases. 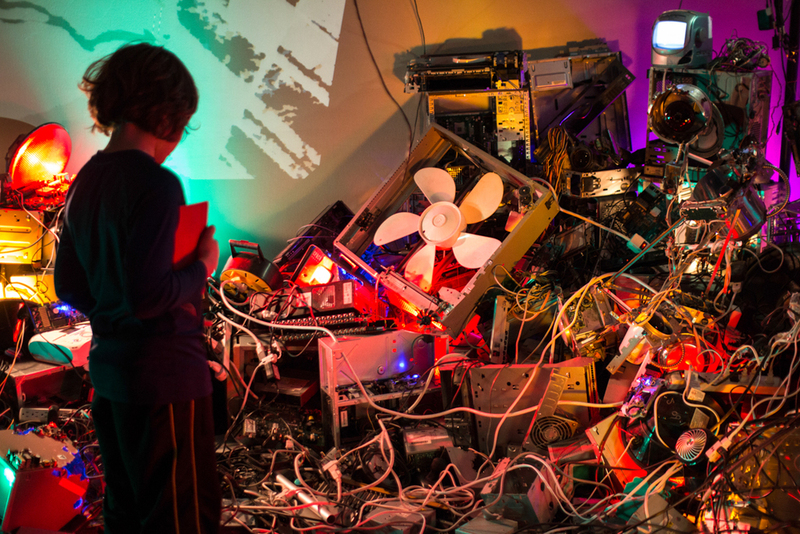 My artwork, “DIGITAL BEING,” based on this hypothesis that technology can unexpectedly evolve, is a series of the media installations created from detritus of broken and discarded electronic devices.